I’ve found painting is always a hit with kids. As a toddler, my son would walk around the house with a dry paintbrush ‘painting’ everything in sight. This is an art project we did last year, when my sons were 4 1/2 and 18 months. We let the kids take turns painting each other’s feet because, well, it’s fun. As a bonus the brushes were VERY tickly on bare feet, which made for lots of giggles. Each child chose 2 colors, one for the ball and toes of their foot, the other for their heel. Once the paint was on, they stepped onto paper (one foot at a time) placing the right foot on the left side of the paper and the left foot on the right side of the paper… so baby toes are in the middle of the sheet and big toes are on the outside. After the paint dried the mommas used permanent marker to add butterfly bodies, heads, and antenna. 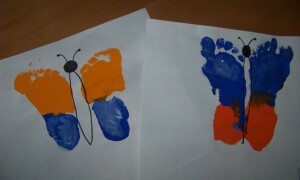 This entry was posted in Art, Keepsakes, What We're Doing and tagged butterfly, Footprint, Paint, spring. Bookmark the permalink.